Do you experience challenges with the process of window cleaning around your home or business premise? Your efforts are not enough to cleanse stains, water streaks and dust build-ups from glass surfaces? The specialists of window washing in Pentonville will give you a hand! Say bye-bye to the countless hours of polishing and wiping – the skilled and experienced team will handle this matter. You will be able to make the most of your extra time – just let us do this monotonous and exhausting work for you. Our professional approach will grant you lots of perks. We also provide our professional services in nearby areas: Canonbury, Kingsland, Essex Road, Newington Green, Balls Pond Road. You can depend on the team - they are one of a kind specialists of window cleaning. They all have passed through complex training sessions, so you can get efficient help for all window kinds. What we can wash includes: small, double, garden windows, bay or sash windows, French doors, patio doors, greenhouses and roof windows. Your building can become better quickly with our assistance. Contact us any time you need great window cleaning for your house or workplace. 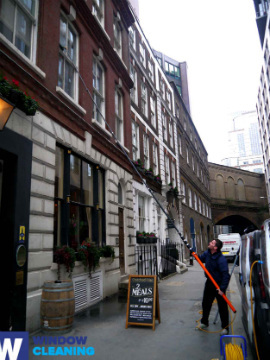 Improve the look of your property – the specialists of commercial window cleaning will deal with that. As part of our distinctive technique, we use water-fed extension poles. With this technique, we can clean entirely the windows from outside of your office, as high as the fourth floor. To reach highly-rised windows we use rope access. We grant your glass panes will look perfect, regardless how highly placed they are. With the assistance of the squad of professionals London's skyline shall never be dirty. The specialists of window cleaning use advanced techniques for the practice of scrubbing and polishing your glass surfaces, skylights and greenhouses. Our water-fed extension pole feature allows us to reach as high as the fourth floor. The pole is attached to a water supply in the van, eliminating the probability of damage to the exterior of your building. We also use high pressure cleaning as part of our window cleaning routine. You can also take advantage of these worthwhile routines. Profit from our residential window cleaning in Pentonville – we provide five-star services for your home on low prices. We use purified water to clean the windows inside and out. We stay safely on the ground and clean with water-fed pole technology. Talk to us now - dial 020 3746 3113 or just use our booking form. Our staff will help you book and answer all of your questions. You will be delighted by the end-results of our household services, we assure you to that!